When the Danish composer Vagn Holmboe (1909-96) started to write guitar music, he had already been composing for half a century. Captivated by this ancient instrument, Holmboe wrote two beautiful sonatas and a number of solo pieces as well as duets for guitar and other instruments, combining his love of simple, transparent structures and organic musical development with the folklore of foreign cultures and his own Nordic roots. "Sivebaek and his colleagues play this music with love and expertise. I’m happy to have discovered it, and I’ll return to this disc often." "The performances by everyone but especially by the star Jesper Sivebaek, appear flawless and the recording ideal." "Exemplary craftsmanship, subtlety of nuance and a profoundly satisfying experience." "Danish label Dacapo's ongoing Holmboe-fest, a truly fantastic series that stretches back many years and which has yielded more than a dozen albums. This review considers the latest half a dozen." I Preludio (Allegro rubato) 3:57 6,40 kr. II Adagio 3:30 6,40 kr. III Fugato (Allegro giocoso) 2:27 6,40 kr. IV Intermezzo (Tempo giusto) 2:42 6,40 kr. V Rondo (Allegro moderato) 3:01 6,40 kr. I Moderato 2:26 6,40 kr. II Allegro giocoso 1:37 6,40 kr. III Andante 2:19 6,40 kr. IV Allegro rubato 1:42 6,40 kr. V Poco adagio 1:56 6,40 kr. VI Allegro 1:30 6,40 kr. I Rubato 2:12 6,40 kr. II Allegro 1:12 6,40 kr. III Andante 2:24 6,40 kr. IV Allegro piacevole 1:42 6,40 kr. V Andante 2:28 6,40 kr. I Liberamente – Animato (L’istesso tempo) 2:42 6,40 kr. II Liberamente – Andante con moto (L’istesso tempo) 3:10 6,40 kr. III Liberamente – Allegro con brio (L’istesso tempo) 2:31 6,40 kr. I Adantino 3:06 6,40 kr. II Moderato 1:33 6,40 kr. III Brioso 1:22 6,40 kr. IV Poco adagio 2:16 6,40 kr. V Lento – Allegro – Lento – Allegro 2:38 6,40 kr. Canción de siega. Tranquillo - con moto - 2:15 6,40 kr. - Allegro leggiero - 1:04 6,40 kr. - Adagio - tempo primo 2:16 6,40 kr. Danza. Allegro piacevole - meno mosso – 2:53 6,40 kr. I The Three Ravens, England 0:50 6,40 kr. II Allegro, Israel 0:35 6,40 kr. III L’etait une goélette, France (It was a scooner) 0:46 6,40 kr. IV Dans les Prisons de Nantes, France 1:01 6,40 kr. V Andante, Ukraine 0:50 6,40 kr. VI J’ai descendu dans mon Jardin, France (I went down into my Garden) 0:31 6,40 kr. VII Mi fa’r han ga mæ femten får, Denmark (My father, he gave me fifteen sheep) 0:52 6,40 kr. Encore: Moi j’ai cinq sous, France 0:48 6,40 kr. Guitar music does not loom large in Vagn Holmboe's extensive production of some 400 works. He had composed for half a century before 1979, when he took up the instrument in four solo works: two sonatas, five intermezzi and five pieces entitled Parlare del più e del meno (To talk about this and that). There are also some duo works: Duo Concertato for violin and guitar, Seven Folk Ballads and Canto e Danza for recorder and guitar. Vagn Holmboe (1909-96) studied at the Royal Academy of Music in Copen----hagen at the end of the 1920s. His teachers were Knud Jeppesen, the inter--nationally known Palestrina scholar, and Finn Høffding. In 1930 he conti-nued his studies in Berlin with one of the foremost representatives of the neoclassical style in Germany, Ernst Toch. For a period from the end of the 1940s to the middle of the 1950s Holmboe worked as a reviewer on the news-paper Politiken, and for 15 years, 1950-65, he was a highly respected teacher of composition at the Academy in Copenhagen, from 1955 on as professor. His pupils included the later leading lights in Danish music Ib Nørholm (b. 1931) and Per Nørgård (b. 1932). As a young man Holmboe, like many others of his generation, received endu-ring impressions from Igor Stravinsky and Béla Bartók, especially from the latter, since he considered Stravinsky's neoclassical works as too artfully dis-tanced. In addition he came under the influence of the branch of German neo-classicism that was called Neue Sachlichkeit (new objectivity). In opposition to Romanticism where the composer was a genius creating music in splendid isolation, the representatives of the new objectivity, whose leading composer was Paul Hindemith, reinstated the composer as the craftsman he had been earlier. Like Bartók, Holmboe pursued folk music studies in Romania after his student years - his link with that country came from his marriage to a Roma-nian -pianist he had met in Berlin. One fruit of his interest in folklore is the col-lec-tion of Copenhagen street cries in the 1930s, which was republished at the end of the 1980s. But he worked with eastern European and Arab as well as Danish folk music, and like Bartók he worked melodies, rhythms and sonorities from folk music into his own music, which however unlike Bartók's is only rarely based on true folk music. The Hindemith-inspired -objectivity came particularly to expression in a work series consisting of thirteen chamber concertos written between 1939 and 1956, a Danish counterpart of Hindemith's Chamber Music, seven concertos for one or more soloists and chamber orchestra (1922-27), which for its part imitated the Baroque concerto, for example Bach's Branden-burg Concertos. Holmboe stands as the most important heir to Carl Nielsen in the Danish music of his generation. In his works, like his contemporary colleagues Herman D. Koppel (1908-98) and Niels Viggo Bentzon (1919-2000), he takes up the legacy of Carl Nielsen - and Sibelius - on a neoclassical foundation, far from Stravinsky's distance and from the lightweight divertissements known from much of the French music of the inter-war years, but with ties to historical clas-sicism - a neoclassicism so to speak in the spirit of Haydn, to mention one composer whom Holmboe rated very highly. Holmboe was first and foremost a symphonist, from around 1950 with con-sistent and convincing use of his ‘metamorphosis' technique, an organic symphonic transformation technique suitable for creating cohesion in often widely ramified developments of musical motifs and themes of the kind one can study in Sibelius, Liszt and Haydn. Four of his one-movement orchestral works, Epitaph, Monolith, Epilogue and Tempo Variabile (1956-71) thus have the over-all heading Symphonic metamorphosis. In general Holmboe's unusually large output of symphonies and string quartets is a match quantitatively for that of Dmitri Shostakovich, which is in itself an impressive feat - indeed with his total of 20-22 string quartets he outstripped the Russian's ‘mere' fifteen. In particular Holmboe's string quartets (no. 1, 1949; no. 20, 1985), which naturally continue the tradition from Bartók, and which must be considered his true master-pieces, provide richly faceted insight into Holmboe's universe with all that involves of logical development of the material, polyphony, rhythmic vigour, folk-like rhythms and sonorous, cantabile lyricism. Among the symphonies one can mention the breakthrough work no. 2 from 1938, the Sinfonia rustica (no. 3), no. 6 from 1947 and - the most frequently mentioned - Sinfonia boreale (Nordic symphony, no. 8) from 1952. To these one should add Holmboe's ex-ten-sive work with choral music, resulting in among other things the great oratorio Requiem for Nietzsche for vocal soloists, choir and orchestra (1964) and in the -collections of a cappella choral music called the Liber Canticorum (1951-53 and 67). Much of the music written for guitar in the past has typically had a ‘light' character that can be heard in sets of variations, character pieces and dances, often gathered in suites, or concertos. In this one senses the southern Europe-an provenance of the instrument. However, alongside the compositions of these types one also finds freely imaginative, often virtuosic pieces called pre-ludes or the like, sometimes with ‘heavier' content. Holmboe's works are a natural extension of this tradition without neces-sarily being ‘light' music. For example one does not feel any great difference between the suite-like works like the Five Intermezzi and the true sonatas. Holmboe has himself explained why he started writing sonatas for guitar: I wanted to write music for the guitar, and to avoid folkloristic ideas I chose to write a sonata; and since I did not consider that enough, I wrote another.\ The result was characteristic of Holmboe: two compositions that beautifully comple-ment each other. Sonata no. 1, op. 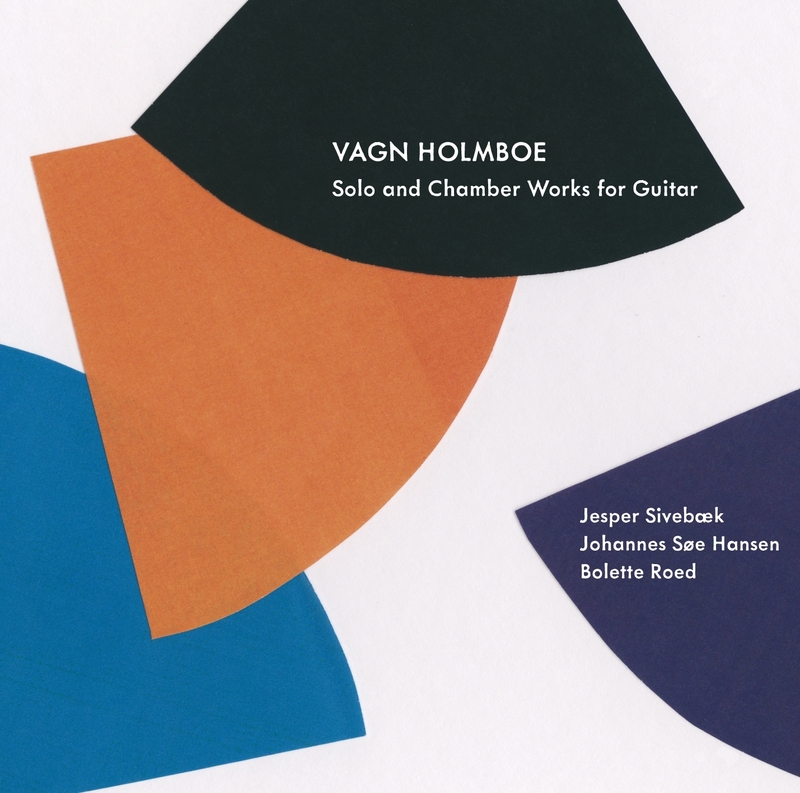 141, from 1979, begins the series of guitar works by Vagn Holmboe. It has five movements which represent different characters: Preludio - Adagio - Fugato - Intermezzo - Rondo. The first movement, Preludio, behind its quick, flexible tempo (allegro rubato) and its dramatic motifs (dominated especially by inverted dottings and fast ascending and descending semi-quavers) is relatively tightly composed. Yet nothing is repeated exactly, it all under-goes constantly shifting developments (as can incidentally be said of most of the movements recorded on this CD). This metamorphosing tendency extends throughout the sonata, in which certain interval sequences, rhythms and types of motion are more or less covertly maintained, as is particularly clear in the slow, beautiful second movement. The scherzo-like fugato movement (allegro giocoso) is notated on two staves and quite capriciously composed with its alternation between toc-cata-like developments and fugato passages with changing although related subjects. The intermezzo movement brings a passing calm before the refor-mulated and summarizing themes of the rondo finale round the -movement off. Sonata no. 2, op. 142, which as noted followed immediately on the heels of the first sonata, has a similar structure. However, its six movements are now given with Roman numbers and have the following character names: Moderato - Allegro giocoso - Andante - Allegro rubato - Poco adagio - Allegro. Stylis-tically, the two sonatas are not far from each other - the two finales are espe-cially similar - but no. 2 seems slightly more controlled and clearly defined, more ‘classical'. With the dramatic fourth movement (allegro rubato) as a pos-sible exception, in this sonata we sense a strange ‘calm' in the way the design develops. And once more we feel that beneath the surface organic intervallic links run from movement to movement. Two years later, in 1981, the fine Five Intermezzi, op. 149, followed; in terms of musical material and composition technique they are very close to the sonatas and could easily have been published as a sonata. The movements have traditional Italian character designations and form a beautifully shaped totality rather like that of the five-movement solo sonatas of Corelli. The fifth movement is the longest. It is based on a little folk-like melody, a Spanish lullaby, which besides beginning and ending the set is also heard half-way. The music alternates between the lullaby and a longer allegro section, and a few times along the way the guitarist knocks out a little fanfare rhythm on the soundboard of the instrument. In 1988 Holmboe added yet another solo work in several movements to those he had already written: five pieces with the Italian title Parlare del più e del meno (To talk about this and that), which in fact remained unperformed until 1994. Again these are finely sculptured movements in a variety of moods. Only two of them offer a quick tempo, the third and the sixth. The pulse is predominantly calm or slow, which gives the work a generally serious feel. The first movement (andantino) has a rondo-like form with frequent returns to the calm introductory theme, which each time works its way up and out in repetitions of demi-semiquavers. The second move-ment (moderato), like the fourth move-ment (poco adagio) is built up over a similar thematic contrast, while the third movement (brioso) is the fiery scherzo of the work. The concluding movement is a prelude and fugue (lento - allegro), which is played twice, the second time in recomposed form. In Five Intermezzi and Parlare del più e del meno Holmboe works in several of the movements with a slightly more animated phrasing than in the two sonatas, making use of alternating time signatures. For example the fugue theme in the last movement of Parlare del più e del meno has a 2/4 + 3/4 module. Duo Concertato for violin and guitar, op. 167, is from 1986 and is thus slightly older than Parlare del più e del meno. There are three movements, forming the classic quick-slow-quick sequence, and they all begin with a libe-ra-mente passage which in the first and third movement uses the same thematic material: Liberamente-Animato - Liberamente-Andante con moto - Libera-mente-Allegro con brio. As the title suggests, the duo is a concertante work, not a kind of violin concerto where the guitar imitates an accompanying orchestra (although there are suggestions of this in the first theme of the concluding allegro), but a concertante duo where the two instruments unfold on an equal footing in a lively interplay. Often they play ping-pong with contrasting ideas, but as a rule the composer lets the same thematic material alternate between them dramatically and in the true spirit of music-making, in the finale with elements of folkloristic fieriness. Canto e Danza for recorder and guitar, op. 191, with 1992 as its year of com-position, is a relatively late work. The choice of instruments inspired Holm-boe to write a work of neo-Baroque character typified by transparency of sound. There are four movements: the first is the song Canción de siega (Spanish har-vest song), which continues con moto with varying elaborations on the song. The second and third movements carry on with variations on the harvest song which is quoted literally at the end of the slow third movement (Tempo I). At the end, after the free variations, we hear a sweeping, southern European-inspired dance, Danza. Seven Folk Ballads for recorder and guitar is from 1983 and is the charming fruit of Holmboe's interest in folk music. The settings, actually conceived for bala-laika and guitar, have been composed with a light hand and formed as a diverting suite of atmospheric miniatures. Five countries are represented: Eng-land, Israel, France, the Ukraine and Denmark each contribute a folk ballad, while four are French, including the encore (no. 8).